You can re-use the artefacts that you collected under Content in as many pages as you wish. On the landing page of the portfolio, you can do the following. Click the Create page button to start a new page from scratch. 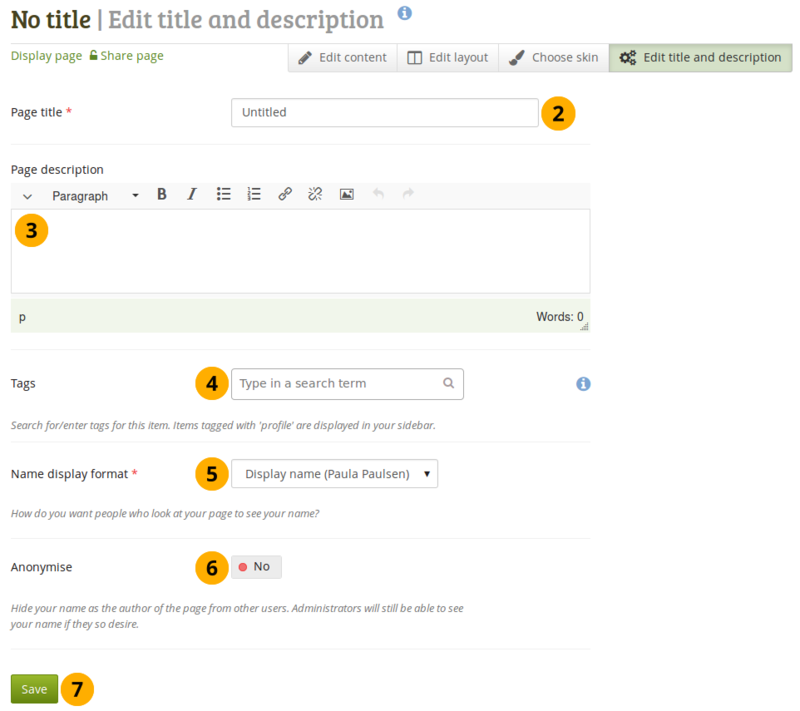 Click the Copy a page button to choose an existing page of yours or from another user as basis for a new page. 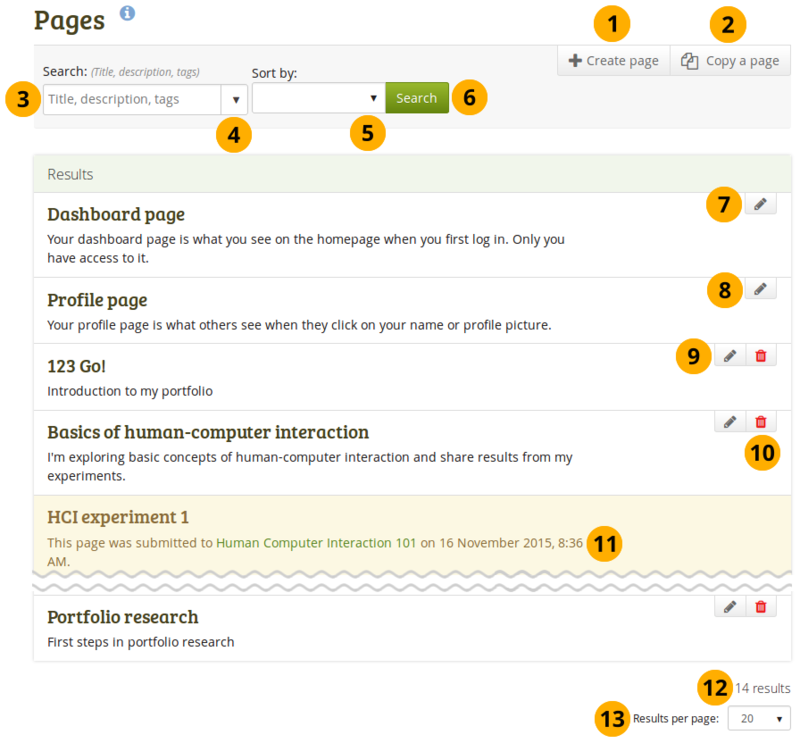 Sort by: Decide on the sort order in which you wish to display your pages. None (blank): The default sort order lists the dashboard and profile pages before all other pages. Pages are displayed in alphabetical order. Date created: List the pages in chronologically reverse order with the newest pages first. Last modified: Display the pages in the order of their last modification with the most recent pages that have been changed first. Last viewed: Show the pages in the order in which they were viewed by you and others starting with the most recently viewed pages. Most visited: Display the pages that have been visited most first in the list. 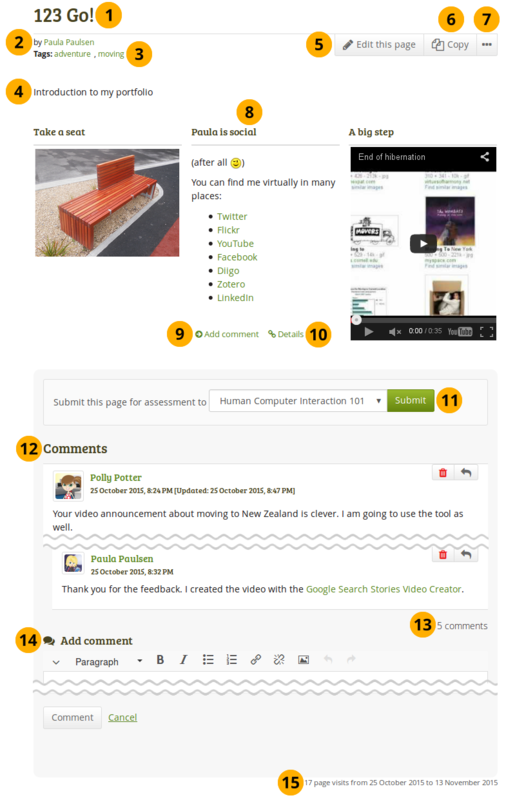 Most feedback: List the pages in descending order based on the amount of feedback they have received. The sort order that you does not change when you navigate away from the page or log out. When you change the sort order, that new setting will be used until you change it again. Click the Search button to search your pages based on your search and / or sorting criteria. to make changes to your dashboard page. You cannot delete your dashboard page. to make changes to your profile page. You cannot delete your profile page. to update your portfolio pages. When you submitted a portfolio page to a group, you cannot change a great number of the page’s content or delete it until the page is released again. You see the total number of pages that you have. You can choose how many portfolio pages you wish to display on the overview page at once. Your options are 10, 20, 50, 100 or 500 results. All remaining pages can be reached via the pager. Your profile page is visible to other users on Mahara by default. If your administrator allowed it, you can also make it visible to anybody on the Internet. 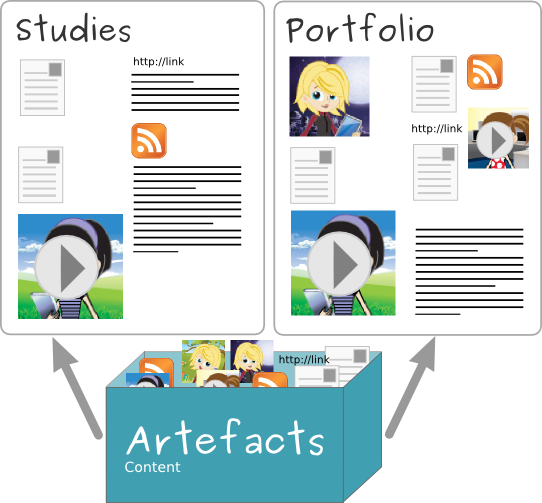 You create a new page in your portfolio when you want to display artefacts together, e.g. for presenting them to others, for showing your progress in a project etc. On the Pages page, click the Create page button. Tags: Enter tags to find your page more easily at a later stage. You can choose from your existing tags by starting to type a letter and then selecting the tag you want to use. You can also type a new tag, and it is added to your list of tags. When you are in the page edit mode, click on Edit title and description. The original, internal Mahara URL, e.g. http://mahara-university.org/view/view.php?id=789 will still work. The sort order on the screen is according to page names in alphabetical order when you clicked the Copy a page button. When you clicked the Copy a collection button, you see the list sorted alphabetical according to collection titles. Edit the page as you would do any other page. You can view a page to check what it looks like when somebody else sees it. Go to the Pages overview page and click on the title of a page. Report objectionable content for this page: If a page contains offensive artefacts, you can report them to the administrator and provide an explanation why you think the content is offensive. 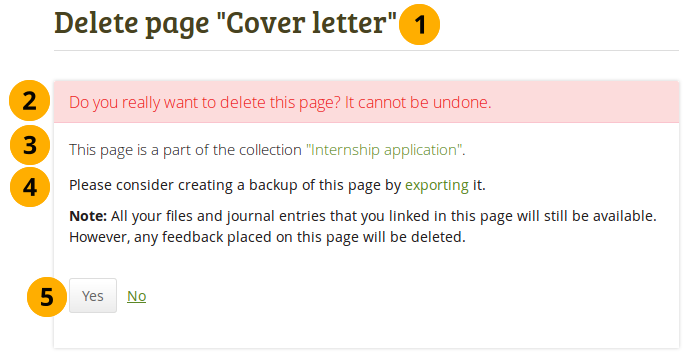 You can delete a page at any time unless it or a collection it is in has been submitted for feedback. When you delete a page, links to external content such as embedded external videos and RSS feeds to an external blog are completely deleted. You cannot recover them. There is no revision history. All other artefacts are not deleted because they reside in your Content area. When you attempt to delete a page, you get the chance to export the page first so that you can make an archive. If your page is part of a collection, the warning message also contains the title and a link to the collection for you to check whether you really want to delete the page and thus make changes to your collection. The title of the page you are about to delete is displayed so you can double-check it is the correct one. An explicit warning about the deleting of the page is displayed. Deletion cannot be undone. The collection of which the page is a part of is linked so you can view your collection. If you want to continue deleting your page, you may want to export it first so you have a copy in case you do need it later again. Click the export link to be taken to the options for the export. We recommend you export your portfolio pages / collections in both HTML and Leap2A formats so that you can view them without the need of Mahara (HTML) or can import them back into the same or another Mahara instance or another portfolio software that supports the Leap2A format. Click the Yes button if you want to continue with the page deletion or the No button if you want to keep your page.